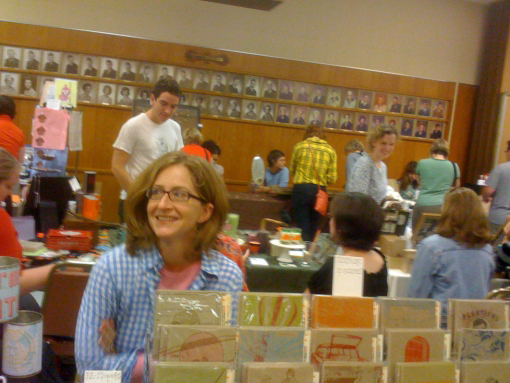 Last Sunday, the basement of the Uptown VFW became home to the i Like You craft fair. The Uptown VFW seems to be three floors of basement. Wait, that’s every VFW. The water-stained, drop ceiling has soaked in more than 50 years of delicious cigarette smoke. The vinyl, accordion fold wall was straight out of my grandparent’s house. I felt like having a poached egg or a ham salad sandwich. Oh, the VFW… so similar to the church basement. Or maybe a bomb shelter. A bomb shelter with awesome junk in it. I recently spent an evening in a VFW for the karaoke portion of a friend’s birthday party. I won’t say whose leg that body was attached to. That’s a silent shame she must carry to her grave. Note the glass of water I kindly placed by her body.